Oil Free Otago are hosting Aotearoa New Zealand’s first OIL FREE FUTURE Summit in Dunedin on 10, 11 and 12 January 2014. Our summit will coincide with Anadarko’s planned deep sea exploratory well off our coast. Our plan is to show Anadarko and the Government the strong local and national opposition to deep sea drilling in New Zealand’s EEZ. It will be a weekend of art, socialising, talking and action. Friday evening will include an art exhibition by local artists: “OIL ON CANVAS”. Saturday will be a day of talks from experts and those closest to the issue, nationally and internationally. The famous “MESS WITH TEXAS” gig will rock the town on Saturday night. Sunday will include a church service, emphasising the link between deep sea drilling and climate change, the most pressing moral issue of our time. The rest of Sunday will be a family day of action on our beautiful Otago harbour. The summit is our contribution to the national campaign against deep sea drilling in NZ. If you can help, we would be stoked! Please email us with any offers of assistance, from funding to organising, or if you would like to get involved in planning, have some cool ideas or just want to find out more, we’d love to hear from you. 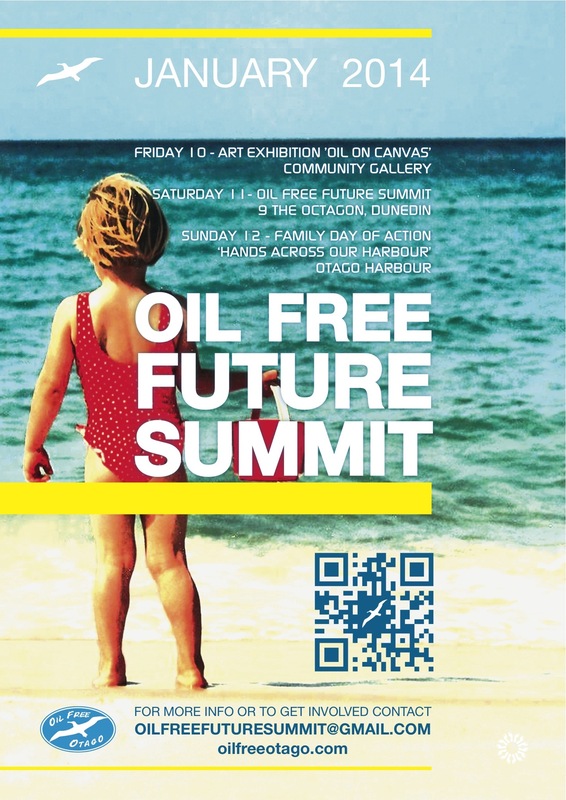 Email oilfreefuturesummit@gmail.com. Save the weekend, and see you in Dunedin! I sincerely hope that no-one intends to drive a car to this event.